December 21, 1922 – Fire destroys much of the Dearborn Street station at Dearborn and Polk Streets as a crowd of thousands crowd the streets to watch. 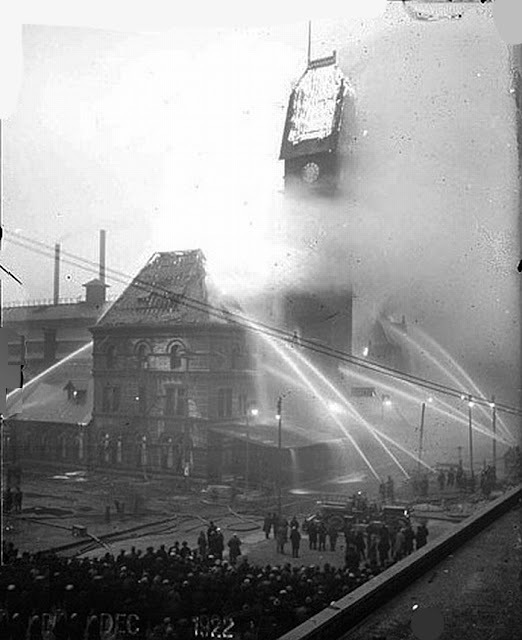 The fire starts on the third floor of the station and “raged across the entire top floor and roared up the tower, which the watchers momentarily expected would fall into the street.” [Chicago Daily Tribune, December 22, 1922] Six hundred employees along with passengers waiting for trains evacuate the station with just one injury. Mrs. Hazel Locker, the assistant chief auditor for the Chicago and Western Indiana Railroad, had to be carried from the structure after being trampled in the crowd escaping the burning building. Three switchboard operators, Mamie Scully, Lillian Michnick and Betty Fennell, are among the last to leave as they work the phones directly under the floor where the fire started until they are commanded to leave. The crowds surrounding the station watch a spectacular blaze. As the Tribune reported, “When the fire reached the tower it roared up the long shaft, which was soon a blazing torch. The clock in the tower stopped at 3:55 o’clock. One by one the big hands on the three faces of the clock dropped into the furnace below. Slowly the flagpole on the top of the tower bent at its base and the crowd which had waited for it to fall cheered when it crashed.” Railroad and postal employees save tons of mail as the fire continues to burn, and officials of the eight railroads that use the station announce that service will continue from the train sheds to the south of the station itself. The station, completed in 1884, was thought to be one of the finest in the nation when it opened. The station came close to being razed over the years, but in 1986 it was listed on the National Registry of Historic Places even as its train sheds were demolished. Today it offers over 120,000 square feet of leasable office and retail space, and it acted as one of the importance anchors that led to the resurgence of the Printers’ Row district and the creation of the Dearborn Station residential development to the south. December 21, 1915 – A banner headline in the Chicago Daily Tribune screams, “Weeghman Admits He Has Secured The Cubs”. Charles H. Weeghman began his career in Chicago as a waiter making ten bucks a week and parlayed a small stake into a collection of 15 Chicago diners that served cold sandwiches. Weeghman roved baseball even more than he liked cold sandwiches, and he wanted desperately to own a professional team. After his attempt to buy the St. Louis Cardinals proved unsuccessful, he teamed up with a renegade group of owners controlling teams in the Federal League. Weeghman gave his Chicago Federals a new concrete and steel stadium near the elevated tracks on the north side of the city on the former site of the Theological Seminary of the Evangelical Lutheran Church. After the Federals, renamed the Whales, barely won the championship in 1915, American and National League executives, tired of the Federal League raiding teams for their players, asked for negotiations before Federal Judge Kenesaw Mountain Landis. The upshot was that the Federal League disappeared, but two owners were given opportunities to buy teams in the older, more established leagues. Weeghman was one of those owners, and it was on this date back in 1915 that the news of his purchase of the Chicago Cubs was announced. His first action as an owner was to hire Joe Tinker as the manager of the team. 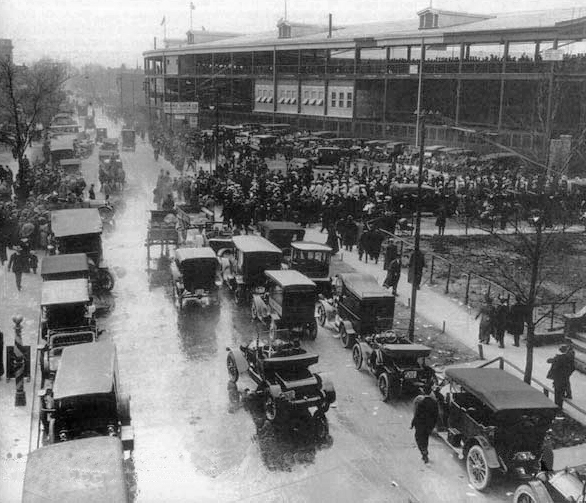 His second was to move the Cubs from their west side location to Weeghman Field at the corner of Addison and Clark Streets. A century and a year later Weeghman’s Cubs would win the World Series. The above photo shows Weeghman Field in 1915.